Items per quantity: Pack of 100 nameplates. Metal nameplates and metal tags. 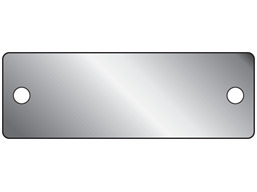 Part of our blank stainless steel nameplate range. 0.5mm thickness. Size 26mm x 76mm, with 2 fixing holes and adhesive backed. Supplied in packs of 100. Blank metal nameplates. Stainless steel, 0.5mm thickness, with fixing holes and adhesive backing. Supplied in packs of 100 nameplates. BMNP3S Size 26mm x 76mm. Material stainless steel.